While fishing out of Argentina’s famed Pira Lodge on January 14th, IGFA Representative Meredith J. McCord potentially set the new women’s6 kg (12 lb) tippet class world record for dorado (Salminus brasiliensis) with this 3.77 kg (8 lb 5 oz) fish. McCord needed only a few minutes to subdue the fish, and once landed the fish was properly weighed, documented, and released alive. The current IGFA world record is vacant. Angler Elizabeth Scott potentially set the new women’s 4 kg (8 lb) tippet class world record for landlocked striped bass (Morone saxatilis) with this quality 5.88 kg (12 lb 15 oz) striper that she caught on January 9th while fishing Beaver Lake, located outside of Rogers, Arkansas, USA. Scott played the fish for approximately 15 minutes before it was landed, documented, weighed, and released alive. The current IGFA world record is vacant. 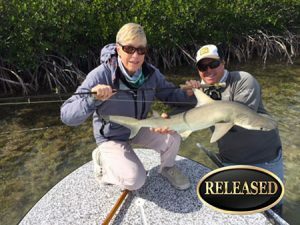 Angler Dotty Ballantyne potentially added another world record catch to her already extensive resume with this 4.65 kg (10 lb 4 oz) bonnethead shark (Sphyrna tiburo) that she caught and released while fishing out of Key West, Florida, USA on January 17th. Ballantyne needed just under 15 minutes to land the fish, which was quickly weighed and released alive after being properly documented. If approved, the catch will become the new women’s 6 kg (12 lb) tippet class record, which currently stands at 3.85 kg (8 lb 8 oz).